Celebrating Diwali | Kid Reporters' Notebook | Scholastic Inc.
My family has always been passionate about observing traditions. “No matter the country, no matter the place, traditions are timeless,” says my mother, Usha Parupudi. In India, my ancestral homeland, one of the most beloved traditions is the setting off of firecrackers during the Hindu festival of Diwali. 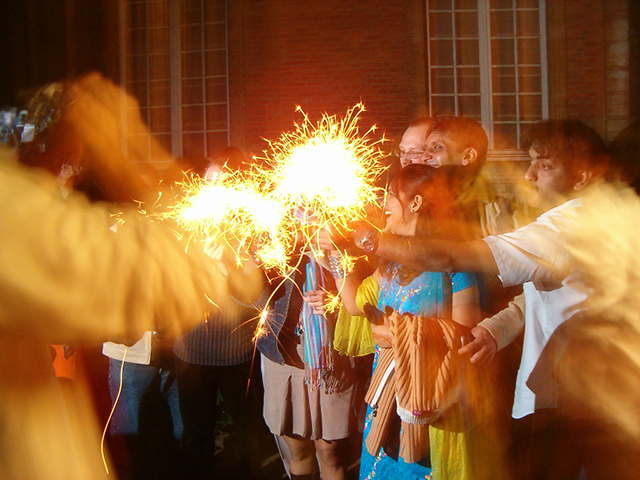 Diwali is celebrated for five days each autumn. The festival coincides with the start of the Hindu New Year, marking the triumph of light over darkness and honoring Lakshmi, the Hindu goddess of wealth. Sweets, gift exchanges, and fireworks are all part of the celebration. Purchasing fireworks at an open market is thrilling for my brother, Abhinav, and me. Part of the process involves “bargaining with the store owners to get a reasonable price,” according to my father, Srinivas. Although lots of fun, firecrackers can be extremely dangerous. Two years ago, a child on my street was badly injured by a firecracker that shot out of a bonfire. The incident made our entire community more aware of the dangers of fireworks. Fireworks are also a major source of pollution in India. As a result, they were temporarily banned in New Delhi, India’s capital. That did not stop people from purchasing them illegally. Rohan's mother, Usha Parupudi, made this rangoli with dry flour. Another cherished Diwali tradition is an art form called rangoli. Elaborate geometric patterns, which are thought to bring good luck, are made from such materials as dry flour, colored sand, and flower petals. The unique shapes that families create are passed down. Abhinav and I like to add a bit of excitement to our celebration by having our mother judge whose rangoli design is better. Neither of us is a particularly skillful artist. Designing rangoli has become a competitive sport in India. During Diwali, millions of people enjoy watching the competitions, with several trying their luck at winning. Participants are allotted a certain amount of time in which to create the best geometric designs they can. Sometimes, national competitions are broadcast on television.